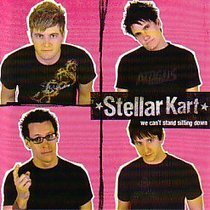 AUGUST 2006: STELLAR KART has come a long way since the release of their debut album last year. They've had three singles at the top of the radio charts, and played over 200 dates touring with bands like Kutless, BarlowGirl, Falling Up and Pillar. All their hard work led to Dove Award nominations for 2006's NEW ARTIST OF THE YEAR and ROCK ALBUM OF THE YEAR, and being voted Best New Artist of The Year by readers of Campus Life's Ignite Your Faith magazine. About "We Can't Stand Sitting Down"
Stellar Kart is a pop punk band from Phoenix, Arizona who started playing together in youth group. The band released their first album, All Gas. No Brake, in February 2005. Most of their singles have been accepted exclusively on Christian radio stations and their song Me and Jesus hit No. 1 for 7 weeks on the Hot Christian Songs chart and won the 2007 Dove Award for "Rock/Contemporary Recorded Song". Their song Something Holy charted at No. 23 on Billboard Magazine for eighteen weeks. The band has played as an opening act for the likes of Kutlass and Newsboys.